At 1FUR1 Foundation, we pride ourselves on our partnerships with new or at-risk nonprofits. We love our current partners, but have always known that there can be more for us to do. “I’m thrilled to launch our newest grant,” says 1FUR1 founder Michelle Djonova, about Heartland Service Dogs, “that helps train PTSD service dogs to be paired with US veterans”. PTSD, or post-traumatic stress disorder, is a big problem for vets. Being ‘shell-shocked’ has been a side effect of active duty for years, but only recently did we identify that it is, in fact, a disorder. One article, by Mark Thompson entitled Bringing Dogs to Heal, concisely states: “the need for good treatment options is enormous: some 40,000 troops have been physically wounded in Afghanistan and Iraq, but 10 times as many exhibit symptoms of PTSD.” That is an alarming statistic. 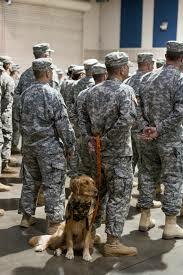 Specially trained PTSD service dogs are a relatively inexpensive and effective way to help soldiers manage their PTSD, at least compared to medications that might not be right for everyone. Rosco is a PTSD companion dog whose main job is to help Syriac, a two-time Iraq war veteran, deal with the disorder and help him recover. PTSD is difficult to deal with and does not need to be handled alone. During flashbacks, many feel frightened or out of touch with reality. Having someone to keep them grounded, especially a sweet, fluffy best friend, would surely make a difference. 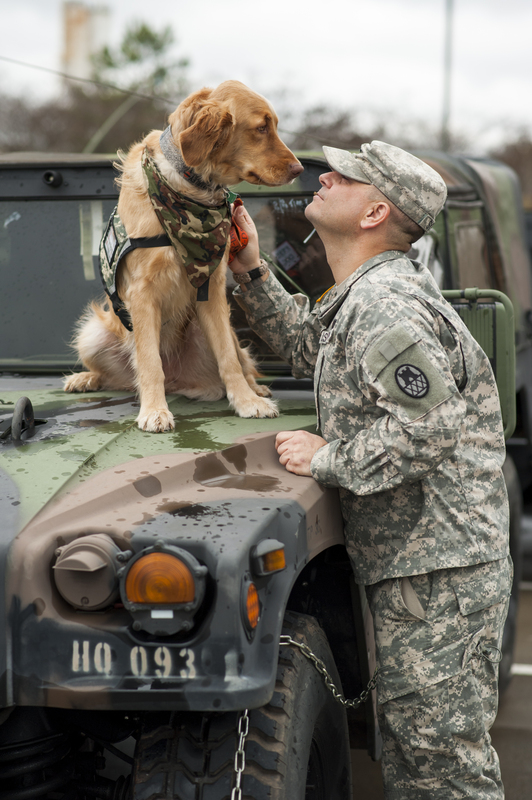 Having a service dog has helped many veterans, and will go on to help many more. 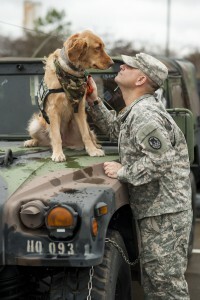 According to K9s for warriors, within six months of being matched with a dog, 86 percent of warriors reduce their PTSD-related medication; 82 percent of warriors report having fewer suicidal thoughts and/or are better able to handle their suicidal thoughts; and 86 percent spend more time with their families. Now, there’s a statistic that is much less alarming. 1FUR1’s grant has begun with one dog that will help a combat veteran suffering with PTSD. The dog has completed basic and obedience training and now is working on advanced training. Learning to ‘block’ a crowd by standing guard in front and ‘cover’ by placing himself at the veteran’s back, were two commands that this special dog acquired fast. Building upon these commands as well as specific tasks that our veteran needs will lay the foundation for a symbiotic relationship between this canine and his warrior. Their bond will be a shield against PTSD stressors and flashbacks, and provide our veteran daily independence in civilian life. Everyone at Heartland Service Dogs and 1FUR1 Foundation is honored to have the opportunity to help our troops who have sacrificed so much for our freedoms. We feel fortunate to be living proof of the profound difference that can be made when people come together to help others.